Perhaps you’ve heard the famous Mother Teresa quote, “It’s not about how much we give, but how much love we put into giving.” But so few of us actually understand what this kind of charity means. Those involved with Texas 4000 have a deep understanding of this adage, as they ride from Austin to Anchorage to fight cancer by spreading awareness and raising funds for MD Anderson. I founded Texas 4000 for cancer to make a difference in the lives of those who struggle with this terrible disease by raising money for cancer research; to provide hope to those people and their families by showing them that there is life after cancer; to educate communities across the continent about how they can detect and prevent cancer. The ride originally was geared toward anyone who wanted to be involved. Riders received their bikes in April from a bike shop in Austin before a June start date. They left Austin with only some of their lodging confirmed. Today, only University of Texas at Austin students can participate. The entire ride is mostly run by students — from raising funds, finding free lodging and host families en route, and giving each other moral support. The requirements develop riders into leaders to ensure that the organization grows over time. “This year, each rider received a bike in November, completed 1,500 training miles, volunteered over 60 hours in the community, raised at least $4,500, and has dedicated 18 months of his or her life preparing for this journey,” says Sarah Kettles, this year’s Rockies route director, whose friend died from cancer. In its 10th anniversary year, T4K expanded from two routes (the Sierra and Rockies) to three (adding the Ozarks). 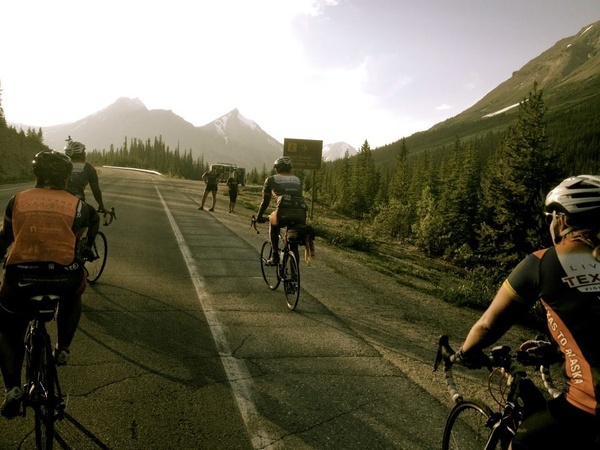 The 2013 team meets in Whitehorse, Yukon, on day 60, and rides the last 10 days to Anchorage together. Kettles says they added the Northeast route to spread the mission across all parts of the United States. After an application process and an interview with T4K alumni, riders begin the real work. Months of training prepare the students on a physical level, but nothing compares to the emotional challenges they endure along the way. The students ride to honor someone who has battled cancer. Last year, the already moving experience took a turn for the riders when teammate Ruel Bobet died from stomach cancer before they took off. Bobet’s former teammate Jessica Friedman says that the 2012 riders dedicated their ride to him and carried some of his ashes to the finish line, where they were spread. Charlie Saginaw, 2010 Sierra rider, remembers fondly the morning dedication circle, where riders gathered with host families and members in the community to talk about how they’ve been impacted by cancer. The stories are what motived the riders each morning to push harder to ride between 60 and 120 miles each day. This year, Texas 4000 will have donated more than $4 million to cancer research. To support the team on their journey, Dallas residents can meet and mingle with the riders over cocktails and small bites on June 4 at Sons of Hermann Hall, from 7 to 9 pm, as they pass through the city.